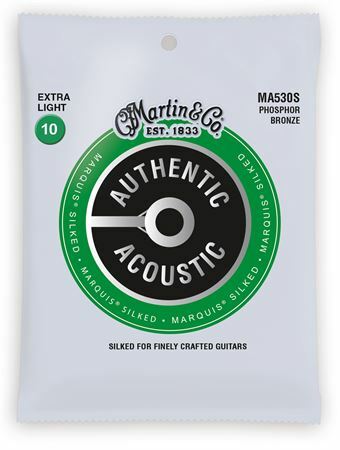 Order your Martin Authentic Acoustic Marquis Silked 92/8 Phosphor Bronze Guitar Strings from AMS and enjoy Fast & Free Shipping. Get the Best Deal with our Lowest Price Guarantee & Great Customer Service! Martin Authentic Acoustic Marquis Silked strings offer thread wrapping for bridge protection, corrosion resistance and excellent tuning stability. Martin Guitar knows a thing or two about pampering valuable instruments. If you’re looking for some extra protection for your fine guitar, Authentic Acoustic Silked strings are the right choice for you. We’ve adding a soft silk wrap to the ball ends of our Authentic Acoustic strings to prevent wear and tear on the bridge and bridge plate as you play. Our silk wrap puts a comforting layer of protection in place every time you change your strings. Available in 92/8 Phosphor Bronze.